We had a great time in Texas but we have a little further east to go. 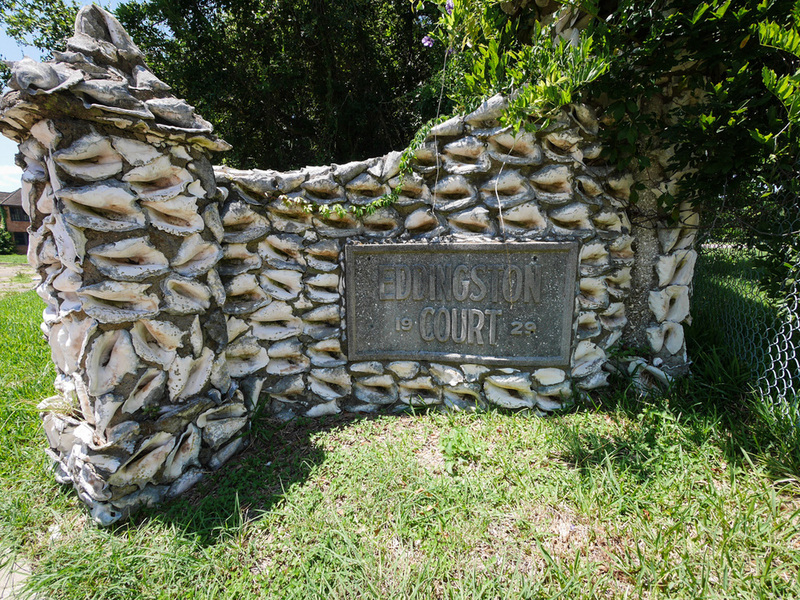 We stopped in Port Arthur where we learned exists the only Conch Shell Wall in the United States. We took a route that took us along the intercoastal waterway travelled by big tankers. The intercoastal is impressive. We also passed many many many refineries, wells and drilling platforms. Those who would like to do away with a petroleum-based economy should come down here, there is an enormous amount of infrastructure investment. It will never go away. At one point in the journey we had to take a ferry across a quarter mile section of waterway. These ferry trips are a lot of fun. While waiting for the ferry to load up and come from the other side I explored the shore. If the Galveston Ferry is not like a Washington State Ferry, this Cameron Holly Beach Ferry is even more different. It is a barge and small. In our row there were two vehicles ahead of us and three behind. I think there were three rows. Not a large vessel. After a bit we turned inland. This area is beautiful and green and nice to drive. The park we're staying at caters to locals here to recreate on the lake. We are outsiders and everyone else knows it. Two different people said to me, "Are you the ones in from Washington?" and another asked "How did you find this place to stay?" We really are far from home and the people around us are starting to notice. Myers Landing is a beautiful place. Most people here are playing on the lake in boats and jet skis. A dip for the dogs to cool down. What do you see, Lily? The trees and the moss. Wow.